Ovando and the Blackfoot Valley are full of history and rich in anecdotes. The first residents of Montana were Native Americans more than 14,000 years ago. Evidence shows the Kootenai have roots in the area's prehistory. The Kootenai inhabited the mountainous terrain west of the divide, traveling only seasonally, and carefully, to the east for buffalo hunts. The Salish, the Pend d' Oreilles and the Crow were probably among the first "modern" Indians to join the Kootenai in Montana, followed closely by the Shoshone, Gros Ventre and Nez Perce. An important Indian trail came up the Blackfoot River from what is now Missoula through the Hell Gate. It was in this gorge that the warlike Blackfeet Indians waylaid and ambushed other Indian tribes to keep them from infringing upon their buffalo hunting territory. The trail followed the Blackfoot river almost to its source and crossed the Continental Divide to the plains country. The Indians called the river the "Cokalahishkit", The River of the Road to the Buffalo. This trail is now the backbone of Montana Highway 200. Meriwether Lewis was the first white explorer to visit the area of what has come to be known as the Blackfoot River Valley. On his return trip from the Pacific Coast, minus William Clark, on July 6, 1806, he camped near Ovando at the confluence of the Big Blackfoot River and a creek, accompanied by nine mounted soldiers, 17 horses, and his Newfoundland dog, Seaman. Lewis named that creek Seaman's Creek after his dog. Today Seaman's Creek is called Monture Creek, named after George Monture, an early day U.S. Army scout. Lewis described this part of the valley as "prairie of the knobs" because of the mounds along the trails, some of which can still be seen today. These knobs are souvenirs of the Ice Ages. Long before Lewis and Native Americans there were glaciers. When they receded they left a morainal topography; or tracts of lumpy landscape full of humps and hollows. The humps are liberally strewn with rocks and boulders; the hollows, commonly called prairie pot holes, hold marshes and shallow ponds. Ice poured down the big canyons in the mountains to the north into the Blackfoot Valley, where it spread out to form large ponds of nearly stagnant ice. The glaciers began to melt and slowly retreat to the north some 10,000 to 12,000 years ago leaving the landscape much as you see it today around Ovando. Ovando came into existence in the 1870's and '80's with the pioneering efforts of the Geary's, McNally's, Jacobsen's, Brunner's, Jakways', Shoup's, Boyd's, Kleinschmidt's, and Ovando Hoyt himself, who the town is named after. Many descendents of these early settlers remain in the area, and the McNally brand "MN" is one of the original brands in the state. Ranching and lumber were the mainstays of the economy. Ovando Hoyt arrived with a herd of cattle and horses in the early 1880's. He later returned from England with his sister Melinda, who is credited with bringing the first dandelions into the valley. "She thought they were so pretty and made such good greens", planting them carefully in her garden. When asked for some dandelions for greens by neighbors, Melinda is quoted as asking them to "wait just a few years, there would be plenty for everybody." Indeed there were. And many are still paying the price in their fields. Hoyt was an inventor, rancher, merchant and the town's first postmaster. The community elected Hoyt to write to Washington DC for mail service and a post office. The town was to be called "Sadiesville" but when he signed his name to the request, the postal authorities said it was such an unusual name they thought "Ovando" would be a better title for the new town and post office. The citizen's of Ovando are forever grateful to those postal authorities. In 1883, six years before Montana became a state; the first post office was built and opened by Ovando Hoyt. Mail was brought to the town on snowshoes, horseback, four-horse teams, sleighs, and wagons. At that time over 1,000 people claimed Ovando as their home. In 1884 a schoolhouse was built with the student population increasing from six to 45 students in a short time. Currently the school educates about 35 students. The Jakways came into the valley in 1892, operated a sheep ranch and opened a merchandising business. Charles Jakways built the first telephone line from Ovando to Drummond by putting the wire on fence posts. Where they ran out of fences he put the wire on trees or stakes. He put old pieces of worm out rubber boots between the wire and the posts. This was called the Blackfoot Telephone Company and this company today is the main telephone provider. The switchboard was at the Jakways' ranch and all ranchers on the local line had to pay ten cents toll to be switched onto the Blackfoot Telephone line for a long distance call or to call Ovando. Today, the remaining 100+ year old buildings that survived are the cornerstone of Ovando's main streets and Town Plaza housing the Community Church, Blackfoot Commercial Company, Custom Welding Design, the Trading Post that houses the Blackfoot Angler & Supplies, and the Brand Bar Museum. 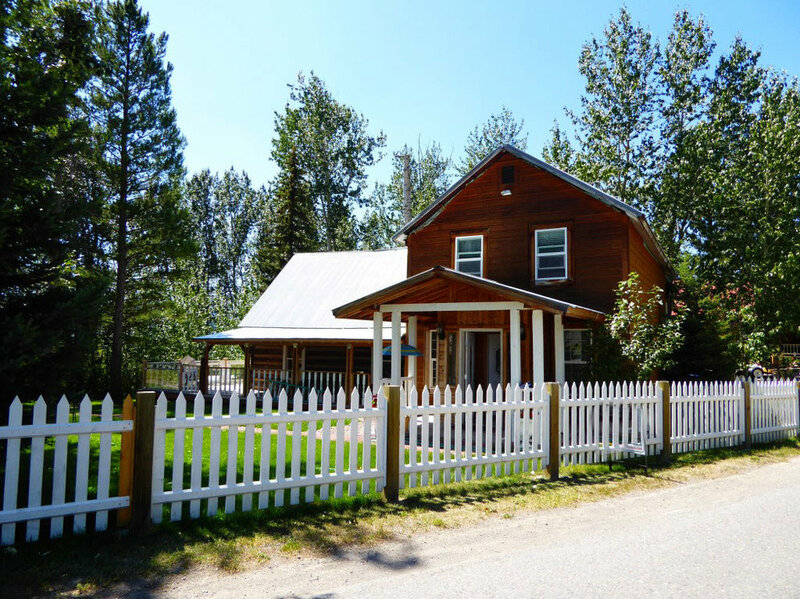 Ovando Hoyt's original home is still intact and located at the end of town, on the creek that bears his name. It currently is starting it rebirth with restoration. *Information for this chapter was found in: "Profile of Early Ovando 1978-1900", "Roadside Geology of Montana" by David Alt, and Montana Almanac by Andrea Merrill.